These summer programs are hosted at university's around the country and open to high school students interested in pursuing engineering. 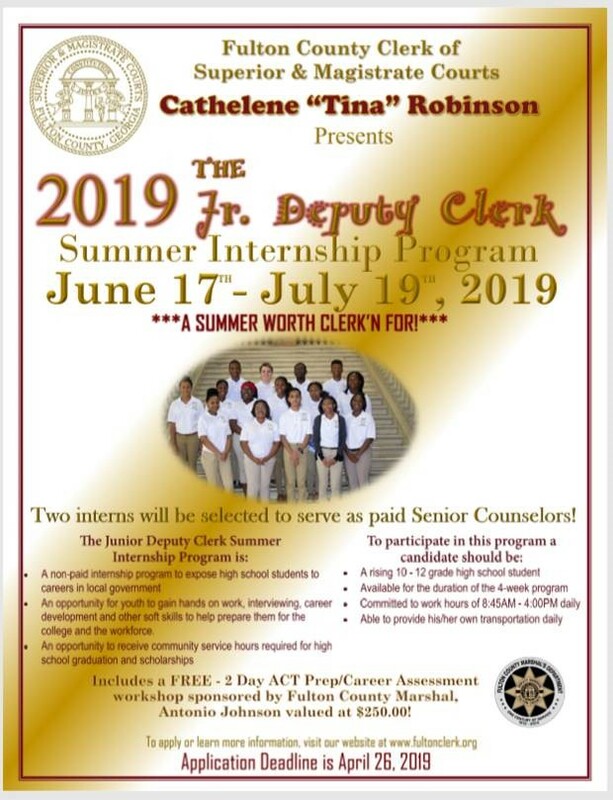 *Now Recruiting: Summer Youth Internship Program: Fulton County seeks to hire youth in need of employment for the third consecutive summer. For the past two summers, the County has spent more than $518,000 to provide more than 315 youth, ages 16-24 with training and paid employment to prepare them for future success. Eligible youth in need of summer employment can apply in person at the Adamsville WorkSource Center at 3700 Martin Luther King Jr. Drive S.W., Atlanta, GA on March 27 and 28 from 10:00 a.m. – 1:00 p.m., the South Fulton Career Center, 5710 Stonewall Tell Road from 10:00 a.m. to 1:00 p.m., or at the Health & Human Services Building located at 137 Peachtree Street S.W. Atlanta, GA 30303 from 8:30 a.m. until 5:00 p.m. Online applications will be accepted through the Community Development Youth and Community Services Division beginning March 27 through April 5 at fultoncountyga.gov/syip. *Fulton County District 5 Commissioner Marvin S. Arrington, Jr. invites the public to be a part of this annual community celebration on Saturday, May 4, 2019 at the Oak Hill Child, Family & Adolescent Center at 2805 Metropolitan Parkway SW; Atlanta, GA 30315. This free celebration will include efforts to encourage healthy lifestyles including health screenings, a kickball tournament, hula hoop contests, an obstacle course, basketball drills, live entertainment, and so much more. *Accepting Applications For the Marshals Junior Deputy Program: The Fulton County Marshals Department is accepting applications for the 2019 Junior Deputy Program which runs from July 8-12, 2019. This program assists with learning life skills, developing mutual understanding, and enhancing personal and mental fitness. Students ages 12 through 16 are eligible to apply if you attend a school in Fulton County, are a resident of Fulton County, or have a family member that is an employee of Fulton County. You must be of good moral character with no arrests or convictions and are required to submit an essay. 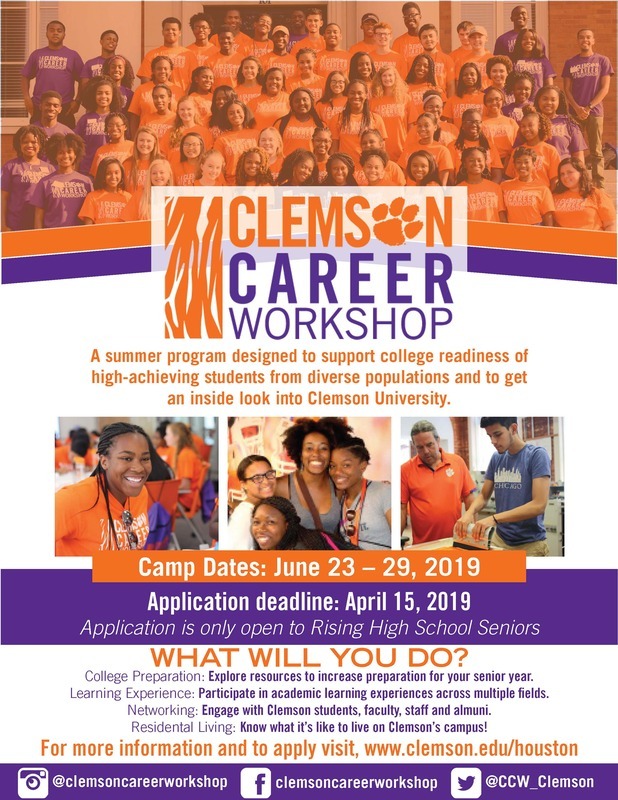 Applications are due May 25, 2019. Applications are available at www.fultoncountymarshal.com. Or contact: Sergeant. M. Hadley, 404-612-4462, mekeal.hadley@fultoncountyga.gov or Corporal D. Stallworth, 404-612-4435, dorean.stallworth@fultoncountyga.gov. Fulton County seeks to hire youth in need of employment for the third consecutive summer. For the past two summers, the county has spent more than $518,000 to provide more than 315 youth, ages 16 to 24 with training and paid employment to prepare them for future success. students with a 3.0 G.P.A. or above. Make new friends and network with other bright high school students! Develop your leadership and entrepreneurship skills! Responsibilities:Southwest Airlines wants to equip high school students with knowledge in aviation and real world experience. This is a great opportunity to grow as an individual and be a part of the Fun-LUVing Culture Southwest Airlines is known for. If selected for an interview, candidates will be directed to upload their transcript and letter of recommendation to their profile. Selected candidates will be scheduled to have in-person interviews at the Southwest Airlines People Office (Atlanta Corporate Center 5230 Clipper Drive Atlanta, GA 30349) on April 27, 2019 between the hours of 9am and 2pm. Please make it a priority to attend the interview session. Inflight Operations: Help support Base Management and deliver outstanding hospitality by providing administrative support to the Inflight Employees. Assist Flight Attendants, Supervisors and Base Management with any duties to coordinate overall Base functions and departmental administrative functions as assigned. Answer calls and provide assistance to callers, provide computer support for all Inflight Base computers and copiers, maintain Employee recognition activities/events, ensure Flight Attendant lounge presents a neat and tidy appearance at all times, stock and inventory all Company related forms and documents to ensure availability. Customer Support & Services: Provide legendary Customer Service by effectively communicate with Customers via telephone and electronic channels regarding booking reservations, selling tickets, and related issues. Data entry, answer telephones, Power Point presentations, update trackers, create and participate in Culture activities, filing, printing projects, mail and delivery pickup, shipping and receiving, provide communication through various channels. This internship is located in Atlanta, Georgia at the Southwest Airlines offices noted above in the job description. All students must apply online at careers.southwestair.com. The Leadership Academy is designed to develop leaders who have the skills to positively influence and impact themselves, their peers and their communities using the teachings of Dr. Martin Luther King, Jr. The intense two week on campus experience prepares youth, ages 13 – 18, to be influential leaders and change agents for their schools, communities and the world. Our aim is to bring educational computer science camps to students across the metro Atlanta area. 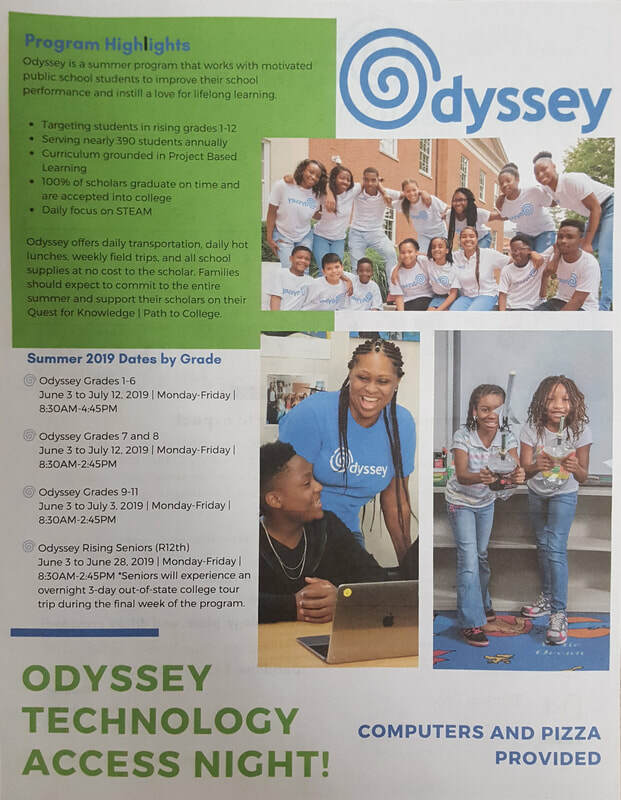 One of the ways we reach students is through a series of week-long computer science day camps for rising 3rd to 12th Grade students. Our camps strive to combine students’ hobbies and interests with computer science and traverse a variety of topics ranging from robotics and drones to Minecraft and audio engineering. Our 2019 summer camp registration is officially OPEN!!! Head on over to our new website http://cs4k12.gatech.edu to check out our camp offerings and register. Please keep in mind space is limited and our programs sell out fast, so be sure to register quickly and avoid the waitlist. ​If you have questions or concerns, please feel free to contact me via email at oecoutreachevents@gmail.com or via phone at (404) 894-2769. Are you interested in taking a six-week credit course? Emory Summer College is for you! The Emory Pre-College Program gives 10th-grade and 11th-grade high school students an exciting glimpse of academic and residential life at a top-ranked national university. In both credit and noncredit courses, students explore a variety of topics with professors who are leading experts in their fields. The Emory Pre-College Program (noncredit) offers students an opportunity to preview the best of college life: from compelling non-credit courses taught by renowned faculty to life on a vibrant campus, from becoming an active participant in the university, local, and global communities to developing friendships with other students from around the world. Emory Pre-College students will experience a challenging college-level academic course, but they will also gain exposure to other academic disciplines, co-curricular and extra-curricular activities, and residential college life. ​A few scholarships are available, so apply early! Trees Atlanta Youth Tree Team! Help us maintain the City in the Forest! 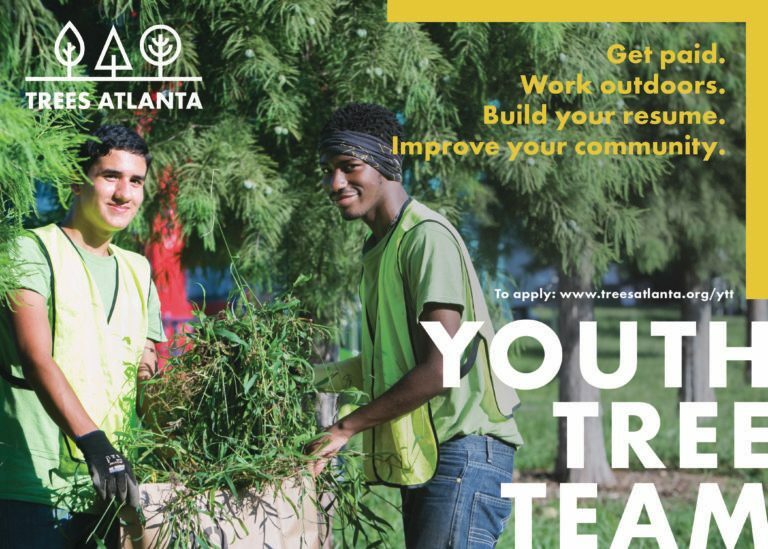 The Youth Tree Team is a select group of Atlanta high school youth and college student leaders. We are seeking candidates who have the following characteristics: initiative, professionalism, respect, interest in the environment, pride in your work, responsibility, and the ability to work well with a team.